When I talked about the Mirage Arcana podcast recently, Josh Sherrer asked me how I saw the relationship between OD&D and BECMI and whether BECMI could be seen as an evolution of OD&D or not. As I replied to him this is a difficult question of course. Evolution implies improvement and I don't think I want to put myself in the position of having stated that D&D is better its predecessor. 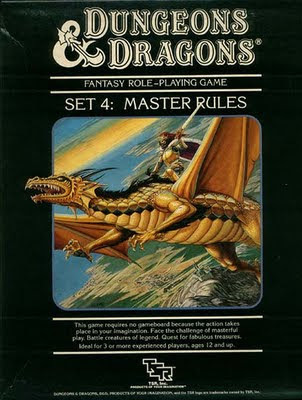 Still, both AD&D and the later versions of classic were a result of criticism that the rules in OD&D were confusing. However with any edition, there seems to be the contradiction that with every attempt at fixing a problem seems to create a new problem. Having said that, my favorite edition is BECMI. I am in general much more comfortable with 1980s material than what was made in the 1970s, possibly because I was introduced to the hobby in the 80s. "I had to stop reading Dragon magazine during the time that I was writing BECMI. Any & All ideas coming from other sources were forbidden; I had strict instructions to base D&D only on the previously published version (starting with OD&D) and, by immersing myself in that, to do the best I could in building upon that foundation and making an entire structure as close as possible to what Gygax & Arneson might have done had they continued to develop and expand it. I failed, of course. While BECMI is a reasonably coherent body of work (all the moreso since it was all from a single author, in stark contrast to TSR's usual design-by-committee approach of the '80s), my own tastes are reflected. (Especially in Immortals, which many find downright weird and generally unplayable, the latter due to their own prejudices imho.) Although Gary and I became fast friends by '83, I didn't get to know Dave until years later, for obvious reasons. Thus lacking half the salient input, the result is more a hybrid of Gary & I than of Gary & Dave. " I always enjoy reading Frank's posts. I like how his intention indeed was to follow "what Gygax & Arneson might have done" and at the same time admitting that this was no easy task, especially since he didnt get to know Arneson until much later. It is interesting however that many of the elements found in BECMI, such as dominion rules, the mystic class and even Immortality had been touched upon in Arneson's campaign so perhaps Frank was more successful than he realized? Interesting comments. I enjoyed the reading, my friend! I would be interested in finding out what the design goals of AD&D were and if it was supposed to evolve from OD&D or B/X. The Advanced Dungeons & Dragons name certainly seemed to be designed to imply it was an "improvement" of Basic Dungeons & Dragons (or some sort of more complex alternative). Your post about becmi fits nicely with arneson I think. I have the impression that gary wasn't big into strongholds and domains. Just read his novels (gord the rogue) or his high level adventures (queen of the demonweb). His characters reach super high level and kill demons and gods then die/disappear/stop playing, whereas arneson--based on reading his FCC, loved the domain game and BECMI really delves deeply into that, much more than Ad&d does. This to me is why the LLB's are so much more complete, really complete than 1e. The two men together were greater than the sum of their parts.